You may have noticed that I elected to not grade Bucky after last week's lopsided win over the mighty Terriers of Wofford. Well, I only grade games that matter, and let's face facts... even when they win big the Badgers don't look sharp doing it. This week we'll crank out some grades for the Big Ten opening win over the Michigan State Spartans (another phenomenal 6th place contender). Look, the Spartans are not that good of a team, but Saturday's win, except for the last five minutes of the fourth quarter, was the best the Badgers have looked all season. I'm auditioning nicknames for Scott Tolzien. Here's what I've got so far: Scottie T or just Scottie (it needs more, I know). Scottie Tz, Big Z. I know, weak, I'm open to suggestions as long as they include "Scottie." As far as the game goes you really can't ask for a better performance. The identity that the Badger offense has established so far has been a passing game supplemented by a running game rather that the other way around. I wouldn't call Bucky pass-first quite yet but this has been the most balanced attack that Wisconsin has had since John Stocco left, and that's all because of their quarterback. So far Scottie does know. John Clay had a nice bounce back week from his bout with fumblitis against the vicious Terriers. He ran for 142 yards on 32 carries, the reason you like this better than the 140-plus yards he had against Fresno is that his long run against the Spartans was only 18 yards. Meaning he had to grit and grind for his 140 whereas against Fresno State he compiled half his yards on one run. Clay was good, backup Zach Brown however, was not. He did not recover from his fumbling problem, laying one on the turf and only had 30 yards on 11 carries. Sorry boys, you are graded as a group and Brown kept the backs from an A grade. Would you like the good first, or the bad? Let's start with the good, Tight Ends. 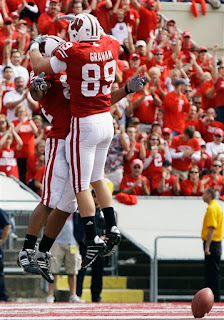 Garrett Graham is the obvious performer, three of his five catches went for touchdowns. But let's talk about the guy you probably haven't heard about, and that would be Lance Kendricks. Kendricks was initially recruited to Wisconsin as a wide receiver, but he had the frame to move to tight end. As he's emerged in the Badgers offense (after a broken leg last year), you can really see why the Badgers are so high on him. Wide Receivers are a slightly different story. By the numbers they looked good, Isaac Anderson has big time ability and Nick Toon looks like a star, but dropped passes are becoming a consistent problem. If Bucky's wideouts can hold onto the ball, they could be much better. How about Peter Konz? The freshman from Neenah, Wis. has been playing Center because of injuries to Travis Frederick and Jake Bscherer and he has been terrific. Round that out with Tackles Josh Oglesby and Gabe Carimi rounding into form after bouts with the flu and you start to think that Bucky's line might hold up when they face off with the Ohio States and Iowas of the world. 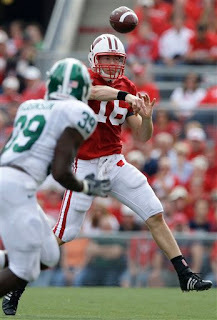 Bucky did a good job of controlling Michigan State's run game, and a lot of that starts at the defensive line. I worry about any injury to O'Brien Schofield, he's too important to the Badger's Defense to be lost for any amount of time. I know it's a broken record, but depth has been, and will continue to be, a problem. We've sung the praises of Mike Taylor before, but it would appear we get to again. The freshman led the team in tackles Saturday and also notched one of three Badger interceptions in the game. Even more impressive might have been the play of fellow freshman Chris Borland. Borland was a force when rushing the quarterback and continues to impress for a first year player. Throw in Culmer St. Jean, Jaevery McFadden and Blake Sorensen and you've got a terrific group of linebackers. This was one of those games that people will say "wasn't as close as the score indicates." But even if the Badgers coughed up a couple of 'meaningless touchdowns' they still count. And it still forces you to question the teams ability to close out games. In post game interviews coach Bret Bielema took the blame for the Spartans 91-yard touchdown pass with 15 seconds left. That said, it was the secondary that got burned. Aside from the mistakes at the end of the game though, the corners and safeties played well. Chris Maragos is following in the foot steps of Jim Leonhard and has gone from walk-on to playmaker. Has anyone else noticed fellow safety Jay Valai on the field this year? Because I haven't. Philip Welch made his field goal and extra-points, and that's all there is to it. They won, and they played well in doing so. But this ends their easy start to the season, Michigan State has hardly looked like a team that some picked to finish third in the Big Ten this season. Bucky beat a team they were better than. The next three games will tell us how good the Badgers really are. So far, we know that Bucky can win games at home, next week they'll head north battle it out for Paul Bunyan's axe at the Minnesota Golden Gophers new home stadium. The Gophers are a scrappy bunch and will provide a good litmus test for the 2009 Badgers. It's also their first road game of the year. After that it's a trip to the horseshoe and a home game against Iowa. After this three game stretch we'll know just how good this team is.